This a Public Service Announcement, so that in the future, no one has to suffer the ridicule and humiliation I recently had to take from my husband. (Of course, the worst part is that he didn’t actually SAY anything ridiculing or humiliating, he just had to smile at me). Make sure you read the label to make sure it is actually dishWASHER soap. 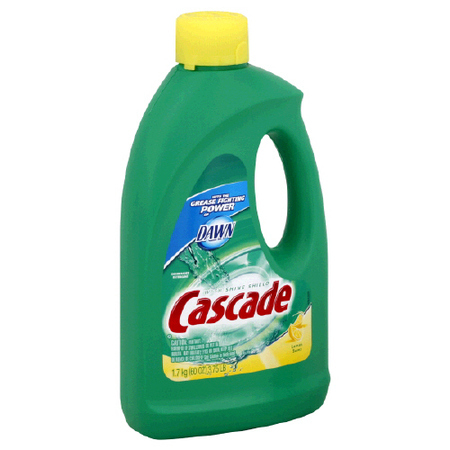 Not just dish soap. 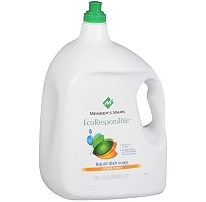 Because you dishwasher will not like it when you load it up with regular dish soap. On the bright side, you’ll have enough dish soap for your children to use for many years of happy hand washing. Some day soon, I promise to get back to posting things about quilts and knitting and other crafty pursuits, but for now, I thought it was important to make sure that none of you make the same mistake I did. p.s. luckily for me, the dishwasher was fine, it just had to run a 2nd cycle to clear all of the suds out. and there were a lot of suds. I’m sorry but I’m ROFLOL! I had to say that, but in all honesty…I did that once too. Bubbles coming out of the sides of the dishwasher onto the floor and oozing all about. I’m sooo disappointed you didn’t take photos. Did it once too. I had suds over half the kitchen floor..which was carpeted! Oh, lordy. I think everyone has to do that at least once. I flooded the kitchen floor with suds. Cleanest it’s ever been. Hmmm. Maybe I should go try it again. i LOVE it when someone owns up to doing something i have not yet managed to do. WTG!! maybe you can’t use it in the dishwasher, but it is great in the washing machine to wash hand dyed fabric. just use a LITTLE. use it up in your washer. can you make soap bubbles? glad i don’t have a dishwasher…i would probably do the same thing. Yep. Been there years ago. Only I loaded the dishwasher in my little apartment and left for an errand. Came back to suds all over the kitchen – a foot deep and out into the little living room. Took hours to clean it up and a long time before I could get it all out of the dishwasher. Kitchen floor was gorgeous, tho. Hunh – you were lucky, mine sudsed all over the floor, and I had to listen to my husband laugh loudly, then call the kids in to see what his “perfect” wife had done. I had no clue that he thought I was perfect until that moment. guess I fooled him huh!